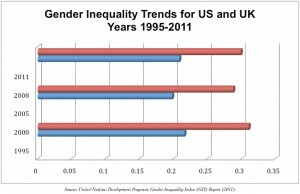 What is the Gender Inequality Index (GII)? The gender index measures the inequality between men and women in work, reproductive health and empowerment. 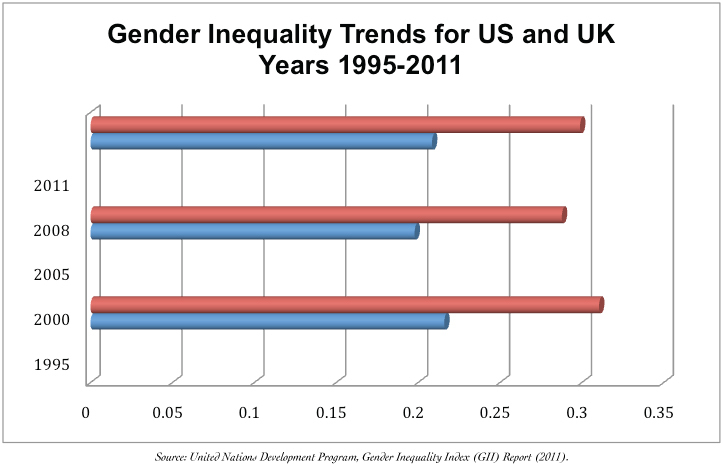 The index measures are zero (0), indicating unequal status of men and women, to one (1) more equality between men and women. The blue bar represents the United States (US) and red for the United Kingdom (UK), for the years and index values shown above. Check out the blog for more information. Brown v. Board of Education (1954) sought to end segregation in education; and yet, nearly 60 years later, schools are more segregated than integrated. Orefield & Lee (2004) wrote that in the post-Brown era urban schools of New York, Virginia, Chicago and South Carolina, the student populations are approximately 98% African American and 1% White. In western state inner-city schools, ethnic minorities are largely represented compared to White students, which is disturbing! Let’s not forget that desegregation began at Central High School in Little Rock, Arkansas (see Central High School Movie http://www.videosurf.com/little-rock-central-high-50-years-later-289288). How can it be that 50+ years later, urban schools are more segregated! We must have the courage to talk about race and racism; we still have to go! KAGL & Affiliates believes that education is a key to freedom. Technology is important to help prisoners, working adults, disabled the opportunity to gain a GED/Diploma to change their life. Evaluation research describes the role of education and crime. Understanding language use can teach us a great deal about oppression. An article recently published in the Wall Street Journal (2010), explains that there’s “new cognitive research” about language influence on the way people view the world (Boroditsky, 2010).Read more. this is one of the nicest blog that i have visited this year. You’ve hit the ball out the park! Inrecidlbe! Education | Wonderful. I understand your stuff and you are just extremely wonderful. I actually like what you have acquired here, certainly like what you are stating and the way in which you say it. You make it enjoyable and you still care for to keep it sensible. I can’t wait to read far more Education | again from you. Thanks for sharing. I agree with your Education, excellent post. I like Your Article about Education | Perfect just what I was looking for! . I came to your site last week and I have been checking it out on a regular basis. You have a lots of good informative stuff on the site and i also love the particular style of your website as well. Keep up the good work!